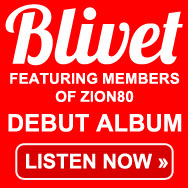 Now that the Zion80 PledgeMusic campaign has been funded (with 200 pledges! ), we’re taking it to the next level. We’re now offering the full WARRIORS album on 12″ VINYL in the Zion80 store. BUT – there’s a very important condition: In order to manufacture the vinyl, we need to sell a minimum of 75 copies.Help us get there by pledging today and sharing with friends. Previous Previous post: We did it!!! Next Next post: The Zion80 Vinyl Challenge: Help Us Get There by June 30!